A clean water filter called a biosand filter has been used for years to produce clean water for households. The biosand filter is an adaptation of the traditional slow sand filter, which has been used for community water treatment for almost 200 hundred years. The biosand filter is smaller than those used for an entire community and has been adapted for intermittent use. This makes modern biosand filters suitable as a clean water filter for individual households. The biosand filter container can be made of concrete or plastic and is filled with layers of specially selected and prepared sand and gravel. Dr. David Manz developed the household biosand filter in the 1990's at the University of Calgary, Canada. Dr. Manz has trained many organizations on the design, construction, installation, operation and maintenance of the biosand filter. Dr. Manz also co-founded The Centre for Affordable Water and Sanitation Technology (CAWST) in 2001 to provide the professional services needed for the humanitarian distribution of the filter in developing countries. Biosand filters were originally constructed of concrete and they continue to be made that way in many places. CAWST publishes their Biosand Filter Construction Manual in PDF format. It contains all details required for construction of concrete biosand filters. In 2009 Dr. Manz, who had already designed and developed a plastic biosand filter, granted Cascade Engineering the license to manufacture and distribute the plastic Hydraid Biosand Filter. 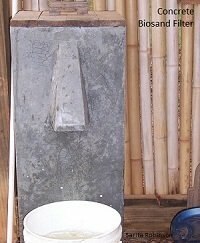 Biosand filters are most often constructed of concrete or plastic. Years of research have gone into perfecting the biosand filter construction and operating parameters to ensure optimum removal of disease-causing pathogens and effectiveness as a clean water filter. It is important, if you are building or distributing biosand filters, that you understand that everything you do in regard to biosand filter components , their construction, operation , and maintenance, directly impacts the effectiveness of biosand filters as a clean water filter. The ability of a biosand filter to remove pathogens from water is directly related to the quality of the filtering media and gravel layer, the construction materials and practices, filter maintenance practices, and filter placement. In short, a biosand filter is more than a “bucket of sand” that you pour water through. Sand filter media and gravel requirements are very specific and operating conditions that optimize their effectiveness as clean water filters have been determined through empirical research in the field involving filters that are being used every day. CAWST's research in improving the performance of biosand filters has resulted in a method of Sand Sieve Analysis that allows those constructing biosand filters to determine if the filter media is of optimun average particle size and range of particle sizes to maximize clean water filter effectiveness. 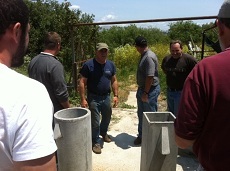 Field Note: Training in biosand filter construction takes place a couple times a year at Lifewater International. A diverse group of awesome individuals learn the techniques and technicalities of constructing effective biosand filters. These people will, in turn, go to many parts of the world to train others. Biosand filters are made of locally available materials and locally learnable skills. They are more than water filtration appliances. Introducing biosand filters in areas where this technology is appropriate, opens up a new industry to the area. It creates jobs and results in economic development. Concrete biosand filters are produced using a steel mold. Each mold can be used to produce hundreds of biosand filters. They have some advantages over plastic filters in that they are much more durable. They can be painted to suit the tastes of the owners and become a kind of kitchen appliance and a part of the household decor. Almost every step in the construction and assembly of a concrete biosand filter can become, in effect, a cottage industry. 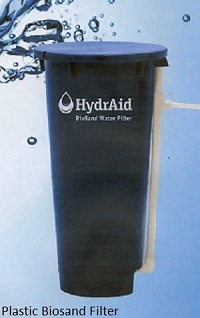 A small group of people with a biosand filter mold can produce hundreds of clean water filters. These filters can be sold or traded as a small business. Construction can be done in a relatively small area with basic tools and resources. The sifting, sorting, and selling of the filter media (sand), and the sand and gravel for concrete can become another small business. Even the construction of diffuser plates and lids for biosand filters can be a cottage industry. For this reason, concrete biosand filters can become a vehicle for community development, providing a livelihood for individuals who are engaged in the construction and assembly of the filters. One disadvantage of concrete biosand filters is that they are very heavy. It takes two people to lift even an empty filter with no sand in it. No one is going to run away with it, but distribution and transport of concrete filters requires resources and planning. Plastic biosand filters, on the other hand, are very light weight. A child can easily carry an empty filter wherever it needs to go.Transport and distribution is much easier. Plastic filters come molded in one piece. No need for mixing and pouring concrete or for upkeep on a steel mold. Often, plastic biosand filters are sold with pre-sized and pre-sorted sand media included. No need to find, sift, and sort the sand and gravel needed to make a reliable filter. The downside of this is that these components must be shipped. Plastic filter body and accompanying sand still weighs about 200 pounds, so shipment is expensive. If you ship filter bodies only, it would cost much less, but finding, sifting, and sorting sand media and gravel then becomes an issue. If you were to supply a community with plastic biosand filters, you would have to have a secure place to store them, since they can be easily whisked away. Giving plastic biosand filters to a community does not have the community development value of providing livelihood for individuals as you might get from a program based on concrete biosand filters. Keep in mind that the filter media (sand) requirements are the same for concrete and plastic biosand filters. This is one major area that cannot be skimped on. No matter if you use plastic or concrete, the filtering effectiveness will only be as good as the sand through which the water is filtered. Return "Home" from "Clean Water Filter"